We are proud to introduce our Travel Light Violin PRO PAC case. A simple yet elegant case that provides everything that you need as a mobile violinist. 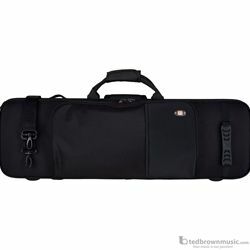 This lightweight case features a tough, water & abrasions resistant nylon exterior with two roomy exterior pockets for your accessories and sheet music. The inside features a soft lining that cradles your violin and the humidity is monitored by a built-in hygrometer.